Stop military escalation with Iran. This week Mike Pompeo announced the Iran Action Group, almost exactly on the anniversary of the CIA-led coup against Iran’s elected Prime Minister Mohammad Mossadegh in 1953. This is part of a broader escalation; e.g., the CIA created an “Iran Mission Center” in January. The Trump administration has been working to destabilize Iran, scapegoating Iran and to “foment unrest in Iran.” John Bolton was promising regime change in Iran before he became National Security Adviser. Trump violated the nuclear weapons treaty by withdrawing for no cause. This new effort will intensify efforts to foment unrest in Iran, the peace movement should work for de-escalation and normalization of relations with Iran to prevent another war-quagmire. 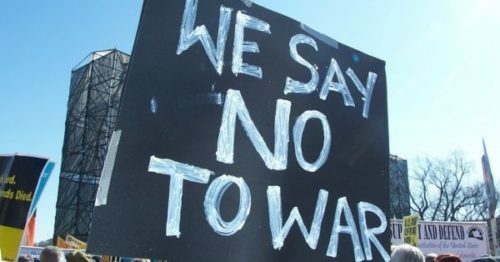 End the longest war in US history, Afghanistan. The Trump administration has escalated US involvement in the war in Afghanistan. This 17-year war has been one of constant failure but now the US is losing badly to the Taliban which has taken over more than 50 percent of the country and can attack Afghan forces in the capital, Kabul. It’s time to bring the troops home from Afghanistan and Iraq. These are just some of the conflicts deserving attention. There are, of course, more; e.g., cut the outrageous military budget, stop the militarization of space, end the war in Syria, remove troops and bases from Africa, negotiate peace with North Korea, create a detente with Russia, end support for Israeli apartheid, stop the economic wars and threats of militarism against Venezuela and Nicaragua, and deescalate-don’t arm Ukraine. While many groups have their own focus, what can a coalition campaign work together on? We also want to highlight Class 7 of the Popular Resistance School on How Social Transformation Occurs, which focuses on the infiltration of political movements by the government, big business interests, and other opposition groups. 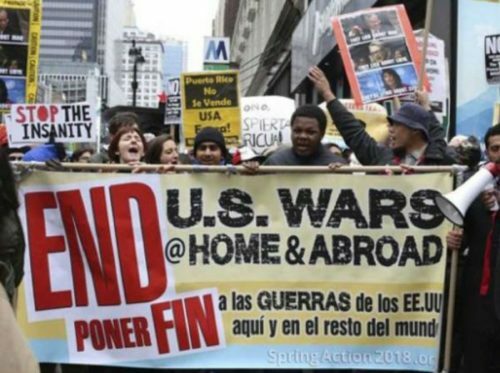 We have written in the past about infiltration; i.e., Infiltration to Disrupt, Divide and Mis-Direct Are Widespread in Occupy and Infiltration of Political Movements is the Norm, Not the Exception in the United States. In this class, we broaden those discussions but also examine how to deal with infiltrators and informants. 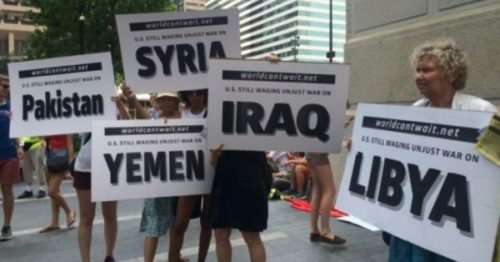 This article was posted on Sunday, August 19th, 2018 at 6:03pm and is filed under "Regime Change", Activism, Anti-war, Donald Trump, Espionage/"Intelligence", Honduras, Iran, Media, Mike Pompeo, Militarism, Nicaragua, Saudi Arabia, Social Movements, Solidarity, Syria, Venezuela, Yemen.